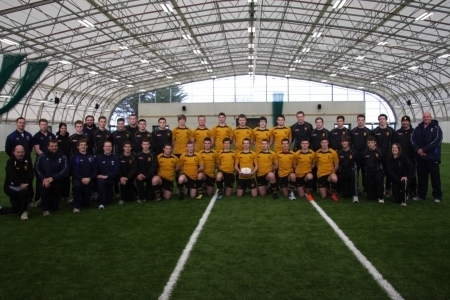 Although losing their final game of the season the RGC 1404 Under 18s finished their regional age-grade campaign on a high as they almost overcame the handicap of playing with a player less, for over 40 minutes, against their opponents from South Wales. Any anxieties that the team might have had about playing in front of a crowd of over 1,000 in the first game to be played at Parc Eirias since it's magnificent re-development were soon dispelled as the North Wales youngsters took the game to their opponents from the opening whistle and it was no surprise that it was the home side who opened the scoring. A penalty kick from man of the match Dion Jones rebounded off the posts back into the arms of the RGC 1404 side and from the re-cycled possesion winger Jordan Sheridan dived over in the corner. Jones added the extras and further extended the home sides advantage when cooly slotting over a penalty from the 22 metre line. Shortly after the whole complexion of the game changed when following a missed lineout from the Blues a mass brawl broke out between nearly all 30 players at the end of which the RGC 1404 side found themselves with 2 players red-carded and one sent to the sin-bin and the Blues 1 red-carded and 1 in the bin. In spite of this numerical disadvantage it was the RGC 1404 side who finished the stronger with captain Afon Bagshaw having a score ruled out just on the stroke of half-time for a double-movement. outstanding with regard to their attitude and work-rate to be so competitive with 13 players on the pitch for all of the second half. The other huge positive factor was the crowd of over 1200 who turned up to watch this game. They were outstanding and created a unique and positive atmosphere for the players, coaches and management and we must thank the North Wales Rugby public for supporting this young regional squad in the manner in which they did. The event itself showed how quickly that Eirias has become the home of regional rugby in North Wales and it bears well for the future of the Region and the senior RGC 1404 team."